Although the Shafer Museum provides a window into the past, it’s clear that the museum’s board of directors keeps an eye on the future, as evidenced by the recent hire of the museum’s first paid director, Suzanne Perin. Perin, who began work in early December, is uncannily well-suited for the position. From her roots as a seventh-grade volunteer docent at Pasadena, California’s, historic Gamble House to her master of arts degree in museology (the study of museum management and organization) and Ph.D. in learning sciences, to her years working in museums and science centers, Perin has been interested in artifacts, collections, and how people learn from displayed objects for nearly her entire life. After visiting the Methow Valley several times over the past few years, Perin, her husband, and their two daughters (ages 5 and 9) moved to Twisp in August 2017. Coincidentally, her daughter’s second-grade classroom needed parent chaperones for an upcoming field trip to the Shafer Museum, and Perin hopped on the school bus. The Shafer Museum’s origin itself provides a story. Perched on Castle Avenue above downtown Winthrop, the Shafer Museum occupies the site where Mr. and Mrs. Guy Waring lived in their dream home (“The Castle”) from 1896-1916. After serving as an Episcopal church for many years, the landmark log house was purchased by local merchant Simon Shafer and made into a museum, which has been expanding in size and scope since 1943. 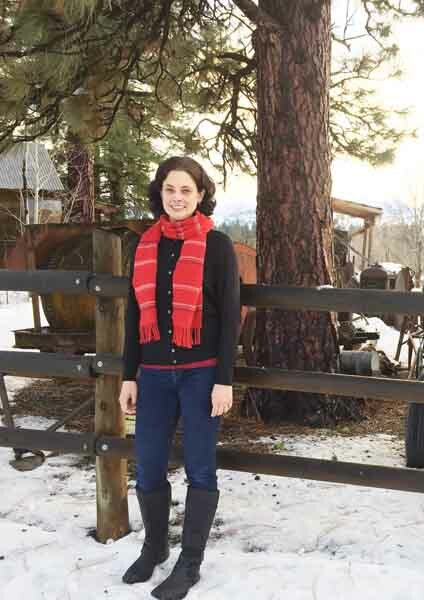 The Shafer family donated the Shafer Museum to the Okanogan County Historical Society in 1976 and a volunteer group formed Friends of the Museum, which dedicates itself to the preservation of the Methow Valley’s pioneer, homesteader and mining heritage. Since then, the Shafer Museum has operated thanks to dedicated board members, an enthusiastic cadre of volunteer docents, revenue from memberships and book sales, grants and gifts. Tireless volunteer Roxie Miller points to a long history of volunteer grit that shaped the Shafer Museum into the flagship American West museum that it is today. In her first few weeks on the job, Perin is looking toward strategic planning sessions with the board, to formulate a vision for what the Shafer Museum will look like in five years, 10 years and beyond. She’s also creating plans for expanding educational programming (including providing online access to museum resources like documents and photographs), providing professional development opportunities for docents, and creating a more robust development program. Perin has also found time to explore the museum and learn about many of the artifacts. “I particularly like the school room,” she said, noting the appeal of the many historic photographs. Perin also admits to a fascination with inventions. “These homesteaders created so many innovations to solve problems,” she said, citing inventions like the sock knitting machine, the nail sorter, and the “lazy husband” yarn holder. Having worked in many science museums and science centers, Perin is aware of how much technology is on display in such places. “The Shafer Museum is full of technology too,” she said of the homesteaders’ devices.